Recently, WTVD News ABC 11 for Raleigh-Durham reported that the mayor of Franklin, North Carolina, Bob Scott has a long tenure of public service. He was in the Army as a public affairs officer. He flew in the Civil Air Patrol. He spent ten years on the Franklin Board of Alderman. 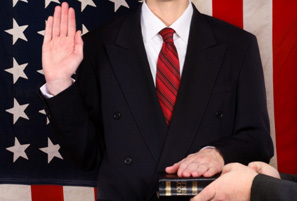 Each time he was sworn into office he placed his left hand on the Bible to take his oath. But this year, which will make his second term as Franklin's mayor, he decided to do something different. He decided he wouldn't use the Bible, but instead swear upon a copy of the Constitution. According to WTVD, Scott said that he had been thinking about the matter for a long time. "I realized we are taking an oath to defend the Constitution, pure and simple, and those are the laws of the land. And If I'm gonna give an oath, that's what I'm giving an oath to. It had nothing to do with religion – for or against – just swearing to protect and defend the Constitution," said Scott. Regarding the office of any public official, Scott also said, "We do not represent any religion, what we represent are the laws of the land. As far as I am concerned, there is no place in government for religion. I'm a secularist in that respect. I just don't think there's a place for any kind of religious doctrine in government because we represent everybody." The woeful ignorance of Scott's view is breathtaking. You can no more separate our nation's form of government from the Christian religion than you can separate smoke from fire or water from ice. Granted, at the start of our fledgling republic, there was a severing of the politico-ecclesiastical ties that had long existed between the church and state. But the separation of the two did not mean the severance of our way of government from God, or from its basis – the Christian religion. As John Quincy Adams, the sixth president of the United States stated, the American Revolution connected in "one indissoluble bond the principles of civil government and the principles of Christianity." This fact is voluminously evident in such matters as the biblical worldview that shaped the resistance of the colonists to King George's tyranny, the Declaration of Independence's references to "Nature's God," the "Creator," the "Supreme Judge of the world" and its signers acknowledgement of "a firm reliance on the protection of Divine Providence." This is not to mention the repeated presidential and congressional calls for prayer and days of fasting in periods of great national challenges throughout American history. Scott may claim that there is "no place in government for religion," but even something as simple as the concluding words of our National Anthem summarize the United States was birthed out of a religious commitment – out of a commitment to God. And preserved us a nation! And the home of the brave." To establish justice – the goal of government as taught in Romans 13 and I Peter 2:14 is to punish evildoers and to protect those who do right. To ensure domestic tranquility – a phrase that comes from the focus of prayer for government, which instructs us to pray "in order that we may lead a tranquil and quiet life in all godliness and dignity." To provide for the common defense – "The protection of innocent human life is at the base of not only capital punishment (Gen. 9:6) but also in the provision of an army for protection from external threats." To promote the general welfare – Romans 13:4 says that civil rulers are servants of God "to you for good." To secure the blessings of Liberty – Liberty is a gift from our Creator, not simply a privilege granted by the government. The government should secure the God-given rights of every man to his life, liberty, and property. No wonder Noah Webster said, "The religion which has introduced civil liberty is the religion of Christ and his apostles...to this we owe our free constitutions of government." the supposition, that morality can be maintained without religion...Tis substantially true, that virtue or morality is a necessary spring of popular government." Mayor Scott certainly has the right to reject putting his hand on the Bible when taking his oath of office, but his choice sends a dangerous message that places every citizen at risk. His actions declare the erroneous notion that our rights come from the state – not God.